TSR DataBridge allows user to import/export data from/to other systems via csv files. This video shows how to export data from TSR with DataBridge. For more details, also on how to import, please see below. Step 1: Select “Export” in the “Action Type” drop down list. Step 2: Click on “Create new” to create new export profile. Step 4: Click on “Show select fields” to select the fields that you want to export, and optionally limit the length of each field. Step 5: Click on “Show search criteria” further down the page, to choose search criteria for the export. Step 6: If you want to preview the exported result, input the necessary information and then click “Preview”. Otherwise, click “Export”. Step 1: Select “Import” in the “Action Type” drop down list. Step 2: Click “Create new” to create a new import profile. Step 3: Fill out the fields in the form. “Source Application ID” is used to identify the source you import from, for example “SAP”. 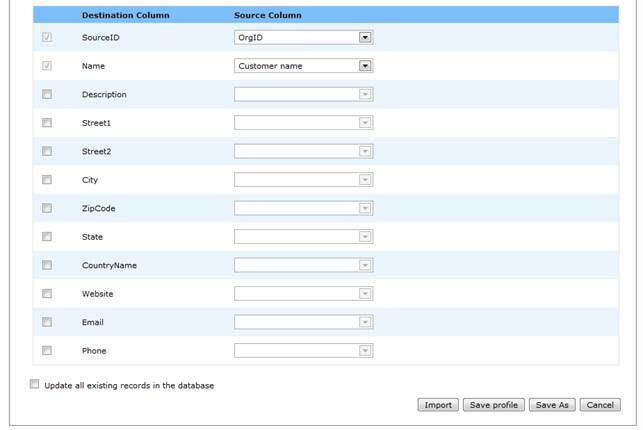 Step 4: Click on “Display columns mapping” to map fields from your file with the TSR database. Step 5: Click the “Import” button to start importing data. Step 1: Select Action Type. Step 2: Enter keyword to search for. Step 3: Click on the “Search” button, and then “Select” to use the corresponding profile. The import/export feature can be performed by a command line tool called TSRDBRUN.exe in the “TSR Command Line” folder. -a: update all records in TSR when importing data (optional). By default, the tool will ask when updating an existing record in TSR. To get the TSR DataBridge Runtime, please contact Support.